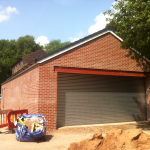 This newly rebuilt 1,600 sqft unit on Lower Healey Business Park is now approaching completion. The unit comes complete with office and kitchen area as well as W/C. Accessible by both personnel and large roller shutter doors, the unit offers excellent vehicle access and has ample parking. We feel it would be ideally suited for a small scale manufacturing, storage or distribution setup. The unit benefits from being on a very secure site, with gated and electronic barrier access systems, and 24 hour CCTV coverage. We expect it will be fit for occupation within the next 3 weeks, and is available at the rate of £185 per week + VAT with no Service Charge. If you would like more information or a viewing of the unit, then please do not hesitate to contact us. We are delighted to announce that Lancashire Land Limited has now completed on the purchase of Kem Mill in Whittle-le-Woods, Chorley. Kem Mill is home to Cheeky Monkeys childrens play centre, and DVM Pigments, and was also previously the home to Woodfit. This property will be added to our growing list of sites, and we hope to be able to release news on more space available to let on this site within the next few weeks.